Caution: Lots of pictures in this post. The construction of this thing took a while and I tried to document the process. The actual construction of this was slowed down some by having to wait for glue to dry. If you want to see the the design portion or my idea post on this, it can be found here. Overall, here's the process I followed for the construction. I started with the base. 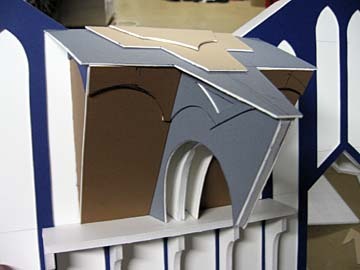 Once I had the actual footprint of the model, I built my walls up from that. Once I had the basic/complete walls cut out, then I went in and created damage along with adding all the smaller surface elements to make the building look believable. 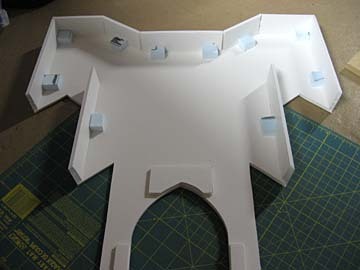 With all the walls "filled out," it was a matter of assembling the pieces together, reinforcing key areas and adding some smaller interior details like trim and catwalks and such. 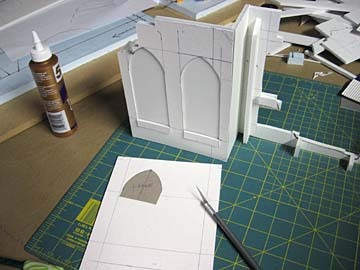 The further I got along in the construction process, the more custom the measurements became. When I first started, I could build things based on measurements and what I knew the distances would be. 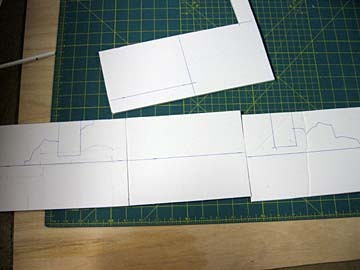 As I went along, I had to measure each thing across all sides to get an exact fit to the piece. This slowed the process down even further, but everything fits together in the end. And if you look carefully, you can see my one Chaos Marine I used for scale purposes. It gives you an idea of the sheer size of this thing. This thing was built to play on. 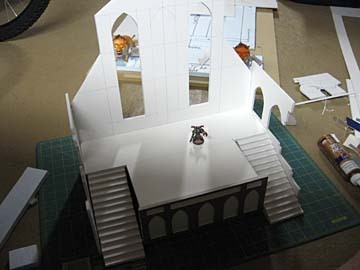 The catwalks are wide enough for 40mm based models to move on. 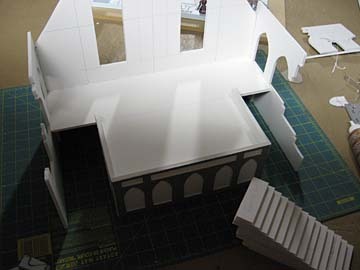 The steps up to the altar area are wide enough for a 60mm (dreadnought) based model to move up without trouble. The hole in the side wall of the building is wide enough for a Rhino to fit through. Actually, I think a Land Raider will fit through it as well. I also was careful not to line up all my openings in the walls so there are places where LOS is completely blocked and places you can see, but the enemy obviously gets a cover save. In the end, I tried to make this a piece you could use instead of something that just took up space on the tabletop that you moved around. Part 3: Pics of the completed model. This is a beautiful model/terrain piece. It surprises me how much reading this post brightened my day this morning. Thanks. Very nice and big project. How big is the base? any chance you have the templates? This piece of scenery blows my mind! Gotta love those lions! Source? Once painted with the appropriate washes they will look like statues. Ron- did you cover all the surfaces with plastic-card or did you leave some of the foamcore paperback exposed? If you left it anywhere, did you spray something on the foamcore to make it more durable? I remember seeing the Citadel cathedral and thinking 'I've got to build myself one of those'. Difference is, you did and it looks awesome! I'm feeling an intense sense of deja vu. Like I've seen all of these posts and pictures before. Down to those orange lions! Did I dream them? Are you updating an older post? Doesn't matter as the structure looks absolutely fantastic and most importantly...has the required open spaces that makes it playable! Can't wait to see the final product, Ron. Nicely done. This is absolutely awesome. Well done sir! Teku: Sorry, no templates. I sort of sketched what I wanted to thing to look like and added dimensions to my drawings. 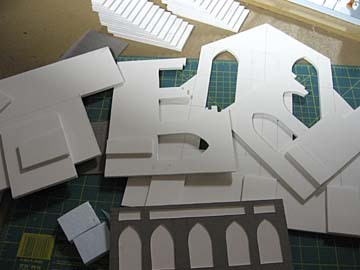 I posted what work I did have in Part 1, but it's not a complete set of templates by any stretch of the imagination. 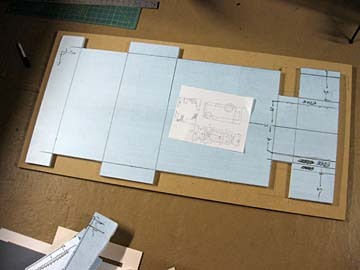 There is so much custom measuring/cutting involved, it would be hard to make templates actually. Jason: There's no way I could have covered everything with plasticard. Money and time would have been the deal breakers. With the exposed foamboard, I had to spray paint (prime) the model with a water based spray. It costs a bit more for each can, but it seals the foamboard and it doesn't eat away at it like regular spray paint can do. After I had it primed, I went in with regular spray paint and added the colors and such. All in all, it took just over a dozen cans of spray paint to paint. Not including washing and drybrushing. Cawshis Clay: You may have, most of these were posted many, many moons ago. Pre-Heresy timeframe... I never finished the project until recently. I figured I would recap the process and then show the final pics next week for those who hadn't seen all the construction and such. Looking food so far. An undercoat of textured paint would've been good to seal with also, and added some nice grit to the otherwise smooth card/foamboard. 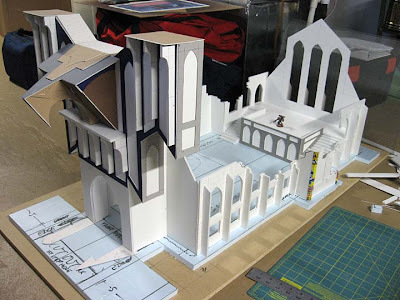 How much time did you spend adjusting your plan for placing minis and such inside the cathedral? 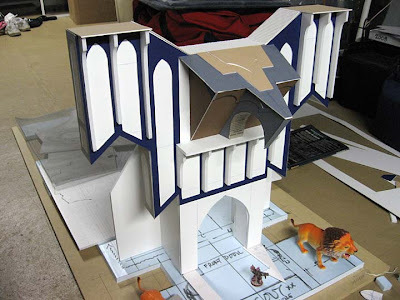 I've planned and built a few terrain pieces and found the most important part was the playability of the piece, and the one I would overlook the most was placing and removing models from within a multistory ruin. It looks like yours is very open and wouldn't suffer from that so much as mine did, but this can be a problem even if you use the Cities of Death kits. #2501: Very true, the only problem with textued paint is that is can be a bit more expensive sometimes and absolutely destroys your brushes when you go to paint/wash/highlight it. Spyrie: Lots. That was the point when I started. Everything was built with putting models on it in mind. 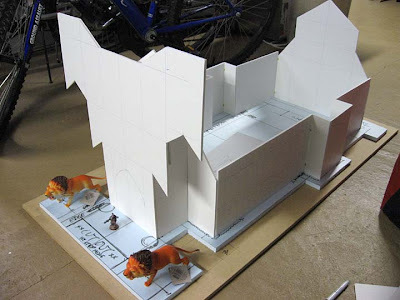 From widths to heights, I used the width of bases to determine how wide things would be. 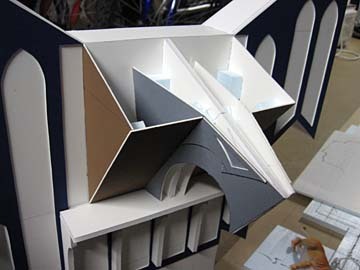 You could say I built it around models as opposed to building it and then hoping the models fit inside. The roof has been blown away (removed) so that you can reach in and get to everything as well. That is some aggressive hobbying. Well done. Hi do you have a pdf version of the templaits of it, I am about to construct a lot of senery for my club I run, would very appreashate it. Christopher: I do not. I made this as I went along and custom built things as I came up with them. I did post my sketches and such in the ifrst post of the series ( link at the top of this post). They might help some with ideas, but I'm afraid that's all I have.